Mark Twitchell Archives - Steve Lillebuen. Journalist. It looks like Dateline NBC’s rerun of “Deadly House of Cards,” which featured my narrative non-fiction book on the Mark Twitchell case, has resonated with millions of people. Some viewers were shocked by the connections between the real-life serial killer investigation and both Hollywood and the Dexter television series. This episode of #Dateline is mind boggling. I bet a lot of murderers do get ideas from TV shows. This is an angle I explored in-depth while researching and writing The Devil’s Cinema. Last night, I also shared this excerpt from a prison letter Mark Twitchell sent me, where he responds to my questions about his links with Dexter and his crimes. Mark Twitchell has always denied that he is a murderer. It’s clear from this letter that he also seeks to downplay his fascination with Dexter too. This entry was posted in Crime and Justice, Twitchell and tagged Copycat Killers, Dateline NBC, Deadly House of Cards, Dexter, Dexter Copycat, Mark Twitchell, the devil's cinema, Twitter on July 20, 2014 by Steve. Wannabe serial killer Mark Twitchell remains a topic of great interest with Dateline NBC revisiting the case in a rerun of “Deadly House of Cards” this Saturday evening. I was interviewed at length about my research into the case for the two-hour special, but couldn’t share any of the exclusive details. Instead, that information all ended up in The Devil’s Cinema, my narrative non-fiction account of the entire case and trial. There have been a few developments since the episode first went to air. No word yet on if this is simply a rebroadcast or if the producers are tacking on an update at the end of the episode. This entry was posted in Crime and Justice, Twitchell and tagged Dateline NBC, Deadly House of Cards, Dexter killer, Edmonton, Mark Twitchell, Steve Lillebuen, the devil's cinema on July 19, 2014 by Steve. Dexter Morgan’s final resting place revealed in the series finale stunned a lot of fans, but was the controversial twist ending also a veiled reference to Mark Twitchell — a convicted killer who replicated the show in real-life? The ultra-violent Showtime television series concluded its eighth and last season with a bizarre final scene that nobody was expecting (warning: spoilers ahead). In short, Dexter survives sailing into a hurricane and turns up looking like some kind of lumberjack, hiding in a cabin in the wilderness. He has a big beard and is wearing flannel. Of course, Mark Twitchell, who built his own Dexter-inspired kill room and assumed the fictional serial killer’s identity online, is from western Canada. He is also a big fan of Wolverine, the Marvel character who once worked as a Canadian lumberjack. 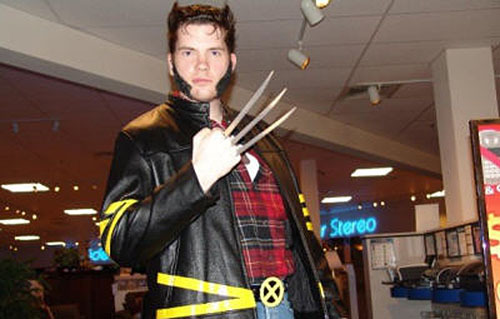 Mark Twitchell, known as the “Dexter Killer,” once dressed up as superhero Wolverine (in flannel) for Halloween in Canada. Is there some kind of Dexter-Lumberjack-Wolverine-Twitchell connection here? Did the show finally acknowledge the “Dexter Killer” case in this round-about way after declining to provide in-depth official comment on the convicted murderer for several years? There is some evidence to back up this wild theory. Scott Buck, who co-wrote the final episode, has given Dexter fans a bit of a hint on what he was really thinking when filming that controversial last scene. This entry was posted in Crime and Justice, Twitchell and tagged Alberta, Dexter, Dexter Finale, Dexter killer, Dexter Morgan, Dexter S8 E12, Jeff Lindsay, Lumberjack, Mark Twitchell, Scott Buck, Showtime, True Crime on October 9, 2013 by Steve.